Welcome to the world’s only Hershey’s Chocolate World Store of its kind displaying 7,000 square feet of chocolate fun! Located on Falls Avenue, Hershey’s Chocolate World is a must see for any chocolate-lover. 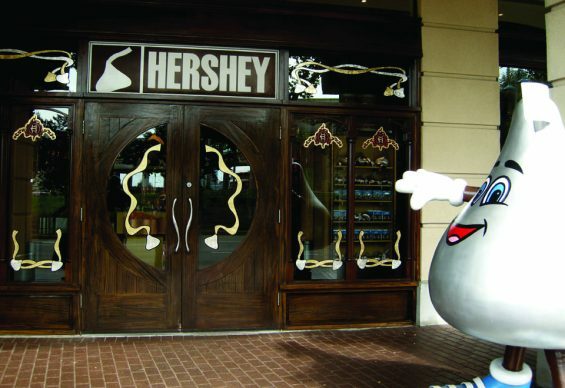 Even the entrance is surrounded in chocolate, enter through the 4-story high Hershey’s Bar. Once inside shop for freshly made chocolate sweets and confections at our fresh food counter or shop for unique merchandise, souvenirs and memorabilia allow you to bring a little Hershey’s home with you. The Hershey Store Niagara Falls is 7,000 square feet of chocolate. Located on Falls Avenue The Hershey Store offers a wide variety of hershey chocolates and sweets, along with clothing and collectables. The Hershey Store Niagara Falls also features its one of a kind fudge, homemade cookies, and other unique treats.